In the Design section, click on the Virtual User tab. Drag and drop the action at the desired point in the Virtual Users tree. NeoLoad creates the action using a skeletal script, which may be either modified or deleted entirely to create a new script. Any change made to a script during the editing process must be validated for them to be applied. Alternatively, changes may be canceled prior to validation, in which case the last script version saved will be reloaded. 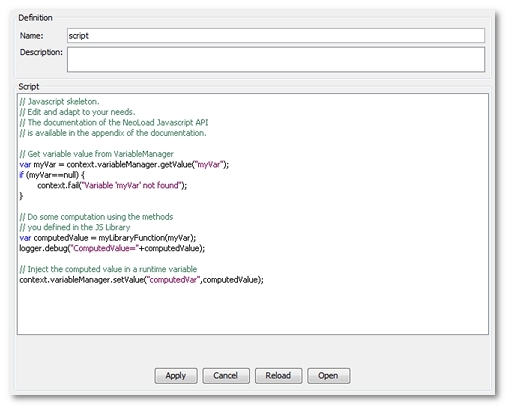 Scripts may be edited directly in the project files (scripts directory). A click on the Reload button allows reloading the content of the edited file into NeoLoad. The script calls the API context.fail(message) method.